Running cadence is an important metric. Although there are individual differences, a high stride rate of around 180+spm/minute for 5K pace and faster is common among elite runners. More importantly, for a given increase in speed, the additional metabolic cost is lower for an increased cadence than for an increased stride length. In this article you will learn how to boost your cadence. Biomechanically speaking, there are 2 ways to run faster. Either you increase your stride length or you increase your cadence (stride frequency), or both. That said, the difference in cadence between a relative beginner and a professional is noticeable, but not large. Stride length, on the other hand, is markedly different between runners of different levels. Sprints are a case in point. Nevertheless, an increase in running cadence matters. That’s because a higher cadence incurs a lower marginal cost of oxygen than an increase in stride length. Therefore – with the metabolic cost added to the equation – you should first max out your running cadence. Some advanced running watches let you measure cadence in real time, which can be compared to your pace and heart rate. Another advantage of a higher cadence is a lower risk of injury. Impact forces are greatly reduced with shorter strides. Part of the reason is that a higher cadence prevents you from overstriding, which reduces the stress on your knees in particular. But all other tissues, too, will benefit from an increased running cadence as the load for each stride decreases at the same running pace. 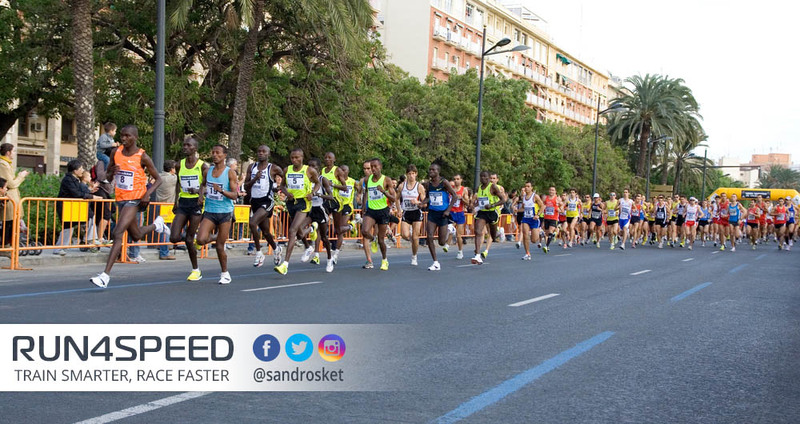 While it takes a serious training effort to improve your stride length (and the additional VO2max power required to fuel it), your cadence can be enhanced rather quickly. A good target is 180 steps per minute (spm) at 5K race pace. Though, a higher running cadence relies heavily on a shorter ground contact time (GCT), which significantly improves your running economy. The first step towards an improved running cadence is your foot-strike. The less time you spend in the stance phase, the faster will be your leg speed. Heel-striking is associated with longer ground contact times (GCT) whereas midfoot and forefoot striking feature lower GCT times. Besides, the Achilles tendon stores less energy in heel strikers, which hampers running economy as well. The solution is proper hip alignment. That means you will have to run with your hips thrust forward and upward so that your feet fall naturally under your body’s center of gravity. Since most of us are guilty of sitting too much throughout the day, our hip flexors are tight and don’t allow for an ideal running posture. So make sure you stretch your hip flexors on a daily basis to counter this. Taking this further, you would want to add plyometrics into your training program. After all, short ground contact times are not a conscious, deliberate action. Shorter GCT times, and therefore a quicker leg turnover, require a well-trained stretch-shortening cycle. Running in place as fast as you can is a good start. Alternatively, skip up single stairs with a focus on speed rather than power. Finally, there are sprints, which are the ultimate form of plyometrics for runners. Note that running itself is a plyometric activity by nature. Since faster paces are also run at a higher cadence, sprints are ideal to ingrain the neuromuscular patterns for a quicker stride. You don’t have to dedicate an entire track session for it, but it would be helpful to incorporate a few sprints here and there. In summary: Running cadence is a metric that should be regularly measured and analyzed. Not only is the metabolic cost lower than for a higher stride length, it also reduces the impact on your joints, ligaments, and tendons. Effective ways to increase running cadence are a proper running posture, plyometrics, and sprint repetitions. In my next article I will cover the impact of stride length.